February Tarpon caught with Capt. Brian at Dream Catcher Charters in Key West. 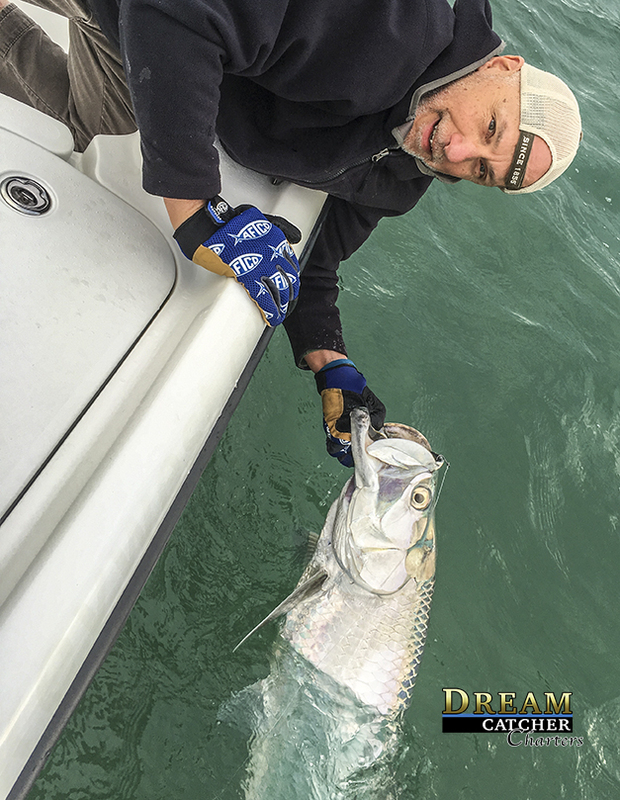 February 26th 2016 – Tarpon fishing report for the Florida Keys and Key West. Winter conditions prevail throughout the forecast period. Cold through the weekend with Northerly winds up to 20 kts. Sounds like a chilly forecast doesn’t it? Well, reading between the lines we see that the cold fronts are cycled about one a week right now leaving a nice mild period when the winds shift out of the South. In that mild period we are seeing and catching tarpon in Key West. South winds bring warm surface temps and make everyone happy including our anglers here in Key West at Dream Catcher Charters. We do not consider is “tarpon fishing season” just yet but its getting close. We have been working the fish pretty good in the last week using live bait during the warming trends between the fronts. For the last week of February and the first week of March Judging by the last tarpon bite we were into I see that the weather on Monday through Wednesday looks pretty nice for a possible bite to come on. Followed by another front on Thursday that will shut the fish down with a North wind once again. We are still not saying tarpon is a good bet – yet.. but here in Key West its becoming decent.. just keeping you in the loop that there is a possibility and we will go after them if we think you will have a shot. No report of tarpon in the upper Keys. Call To Book Your Fishing Charters..
We have trips available from Islamorada To Key West. Veteran Key West Fishing guide Capt. Steven Lamp has been fishing the waters of the Florida Keys professionally since 1993. Specializing in Flats, Backcountry, Fly Fishing, Wrecks, Reef and Offshore fishing in Key West, Florida. Capt. Steven is also the founder and director of Dream Catcher Charters located in Key West, Florida.